Some people like to live fast--drive fast, run fast, and shoot fast bullets like these 155-grain .40 S&W rounds from Federal. The combination of a light bullet and a hot cartridge make this load a very flat-shooting one. Thanks to the .40's flat head and the high velocity of this load, the economical full metal jacket projectiles in this case of 1,000 rounds make a nice clean hole in paper. 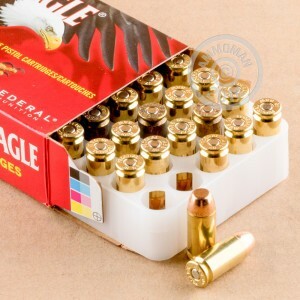 Like all Federal ammo, these rounds use non-corrosive Boxer primers and reloadable brass casings. 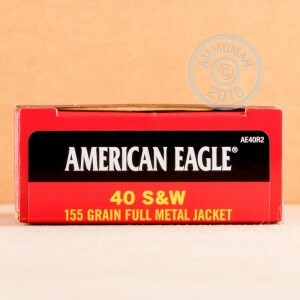 American Eagle, Federal's brand of inexpensive but clean-shooting target ammo, comes from the company's primary production plant in Minnesota. 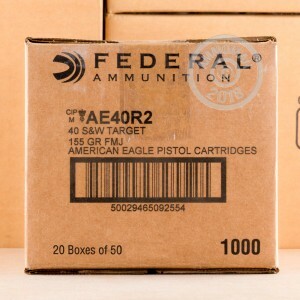 This 1,000 round case ships for free under AmmoMan's bulk shipping guarantee, which provides free delivery to your door for any order over $99.